We are anchored off the beautiful west Maui coastline; & the ship’s tenders will be running continuously throughout the day. On past cruises, I have always docked at the pier on the other side of Maui, in Kahului. It’s a rather industrial looking port area. This is the million dollar view you want to remember Maui by. I got a later start this morning; & the Bistro was very quiet by the time I arrived at 10:45. Even though she hasn’t waited on me personally more than once, Maria already knows what’s supposed to go in my Crystal travel mug (she even remembered I like to stir with the long straw). She took the mug right away, while I got a few things from the breakfast buffet. I timed the Portuguese custard tarts just right. And I also had a bowl of their ‘famous’ muesli, along with my fruit & cheese this morning. In the real world, I’m no fan of muesli; but here it’s fresh & chock full of nuts & fresh fruit. Believe it or not, it’s just as good as the tarts. It was very warm out there today, probably low 80’s with very high humidity. I didn’t really have much of an agenda for my short visit into Lahaina. If I ran across a store that sold Island sandals, I would have replaced a few of my retired colors. And Hilo Hattie’s was further than I was willing to walk. I did want photos of how this small fishing village might have changed in the last 17 years. It’s much busier than I remembered; but it’s still very charming. 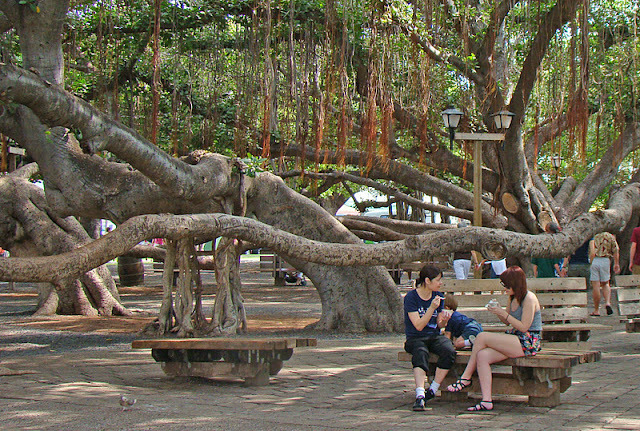 That ancient banyon tree creates an oasis in the center of town; & I love going there. There’s all kinds of (preaching) characters, someone strumming a guitar, families having a picnic, locals taking an afternoon nap in the cool shade. Very picturesque. And last but not least, I was in search of free wi-fi. I thought I’d found it in this colorful little ice cream shop in an alley across the street from the Banyon Tree Park. I bought a cup of caramel ice cream; & sat down. It was not going to be free; but I figured it had to be cheaper than onboard. Maybe my headache was affecting my common sense, but I could never get past the ‘input your credit card info’ screen. The hell with this; I’m giving up the battle after 2 strikes in a row. No more lugging the electronics ashore in hopes of savings a few dollars. I’ll just budget all the shipboard credit they so graciously gave me a little more carefully. I returned on the 1:30 tender; Jamshed was returning from his submarine adventure at the same time. He said it was a blast. The heat, the head; all I really wanted was a little lunch & a nap. When I tried my key card in the door, it wouldn’t work. Guess I let the magnetic clasp on my lanyard necklace get a little too close again. It’s embarrassing going to reception & having to get another card made. Rather than make several trips, I went straight up to the Trident Grill for a burger & some fries. Jamshed asked me to join his table; but I really wanted to take it back to the cabin. Today, I tried the sweet potato fries for the first time. They’re awesome. Two more advil; & I was out for a couple of hours. I remember feeling the engine vibration when we lifted anchor & barely remember hearing Louis sing “Wonderful World”. I went right back to sleep. It was dark when I woke up about 7. Since I had gotten nothing accomplished today on the computer, I went to work. I wrote my dinner order on a notepad; & taped it to the door. Liz is so good; I don’t even have to page her anymore. When she passes by & sees the note there, she sends her assistant right away to retrieve my dinner order. She came with it about 8:30. She had never been to Maui before & was hoping to go ashore herself & check things out this afternoon. But she said she needed the rest more. Tonight’s menu was a little weak, IMO. And if I had been up to dressing & going out, I would have chosen to eat outdoors at Tastes or at the sushi bar in Silk Road. But I managed to find a few things that were okay to tide me over until tomorrow. I started with a mixed green salad with crispy pancetta, herbed croutons tossed in ranch dressing. That turned out to be the big winner for the evening. My main course was pan seared fresh Hawaiian nairagi on a bed of ragout of sweet corn, shiitake mushrooms & peppers. Now I had no idea what this was going to taste like; I chose it because it was the lesser of all the evils. (You’ll understand my dilemma when I tell you that my other choices would have been fried frog legs, glazed ham, Cornish hen or a steak.) It was a thick, meaty, slightly fishy tasting slab of white fish. (After a little online research, I learned that nairagi is actually striped marlin.) I ordered a side of asparagus. What I did not realize was that the ‘gravy’ boat of white-ish looking sauce (which I assumed was Hollandaise to go over the asparagus) was actually a sauce to go over the fish. The menu did not mention a sauce. I also ordered a cheese plate with some chutney; but I’ve put it in the fridge for another time. It’s now nearly 1 am; & if the internet cooperates, I’ll get this uploaded tonight. We’re obviously sailing between islands again tonight because there’s some additional rocking going on. That & some additional Advil PM should help the cause. Hopefully, I’ll wake up tomorrow a new person!